For your information, the 6:55 a.m. Sapa-Hanoi train actually arrives in Hanoi at 4 a.m. This is a problem. I’ve previously marveled that people in Vietnam get up early. They still do, but even here 4 a.m. counts as early. One group that does brave the pre-dawn is motorbike drivers. I stumbled off the train and was greeted by a gaggle of them eager to take me and my money to a hotel. I negotiated a price and hopped myself and my giant backpack onto the back of the motorbike. While the drivers were up early, the rest of the city was still asleep. So asleep, in fact, that the hotels in the part of town that I wanted to stay in were all shuttered up. Metal cages were rolled down and all the lights were out. In the dark, I couldn’t find any of the doorbells to get the security guards to let me in. In the end, I went back to a guesthouse I knew. I dinged the inconspicuous bell and the grandfather who tended to the door let me in, wordlessly handed me a key, then fell back asleep. Moments later, upstairs, I followed suit. The rest of the day was spent bouncing between cafes, writing, snacking, and generally getting fatter. I did discover something new: yogurt and crushed ice mixed with coffee. At first I thought this was some sort of specialty drink, unique to the shop I was in. Turns out it’s not. 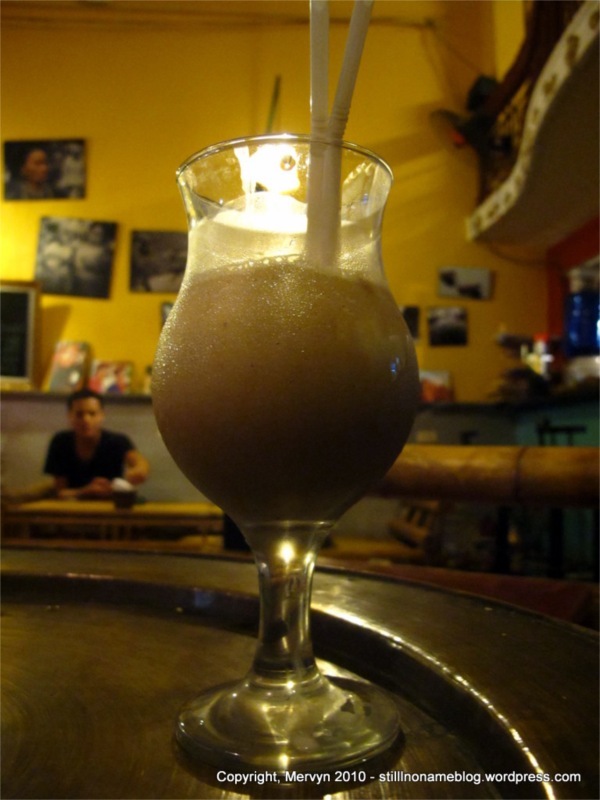 Yogurt mixed with some other flavor and blended with ice is apparently the Vietnamese rough equivalent of a milkshake. It’s actually quite good. The sour of the yogurt mixes with the bitterness of the coffee for a frozen Sour Patch Kids sensation with a java kick. I imagine that the honey or fruit versions balance the sour with a bit more sweet. It’s a simple recipe and easier on Asian stomachs than milkshakes. Lactose intolerance is, after all, quite common on the continent. It’s a novel adaptation (or creation?) and something I’ll have to try when I get back home. GALLERY: Nothing beyond the picture of the coffee yogurt above.